In an earlier post, I mentioned Nick Milton’s useful model for positioning KM. However, I did note that I had reservations as to his assessment of where law firms might sit in the model. This post expands on that thought. As a reminder, Nick suggests that the primary focus of an organisation should dictate the type of knowledge management that is used — process-based, product-based or customer-based. His view was that law firms would tend towards being product-based, as this diagram indicates. I think this is a really useful way of thinking about knowledge activities at a range of levels. It might apply across the whole organisation, or within specific parts. The key then, is to start with a basic understanding of what the relevant people should be achieving and then match the knowledge activities to achieve the desired outcome. I have slightly revised the triangle in my diagram below. 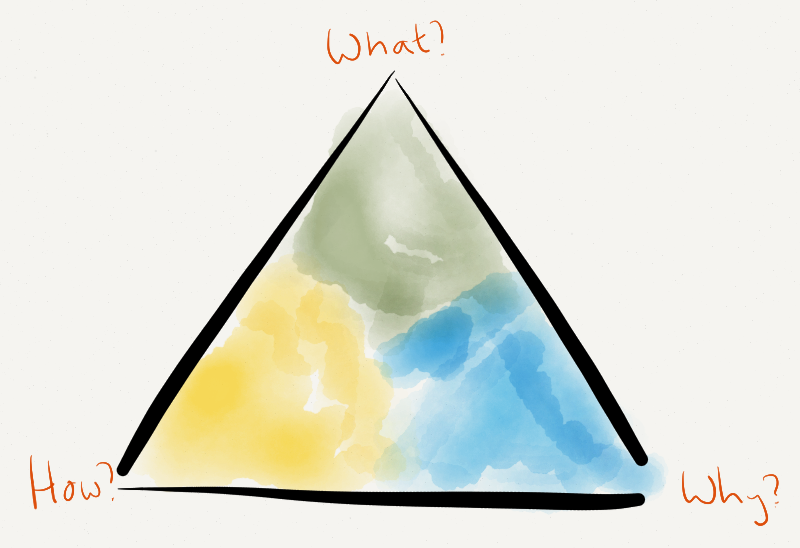 For me, the points of the triangle are characterised by three questions. What do we do, how do we do it, and why do we do it? These questions may contain a number of additional questions too — knowing why something is done will encompass a need to know for whom it is being done, for example. At each extreme, there will be a very different focus. A law firm that is most interested in providing legal solutions (which I think is the example that Nick Milton has in mind) will need to be completely on top of all the changes in the law that affect the creation of those solutions (know-what). On the other hand, a firm that is looking hard at improving the way advice is provided will need to concentrate on know-how — ‘how we do things here’. Firms with a strong client focus will be interested in developing deep understanding of the businesses and people they work with — the legal solution will be presented more as a business solution tailored for that client. Many law firms struggle with anything other than managing legal knowledge (know-what). I think this is a real challenge for the sector as a whole. Unlike many other professionals, lawyers need to work with a constantly changing stream of legal change — new cases, statutes, regulations, court and administrative practices and so on. New law doesn’t just change the range of possible solutions that could be offered, but it can also render previously good advice dangerously bad. Naturally, all law firms take their obligations to stay up to date with the law very seriously. But this is costly. Maintaining access to all the relevant sources of information about and commentary on the law is a significant financial burden. In addition, individuals (whether practising lawyers themselves or the firm’s Professional Support Lawyers) need to take time to understand the impact of legal change on their own work. It is not surprising, therefore, that many firms exhaust their KM efforts at this point — keeping on top of the law is all they can manage. Knowledge management delivers real value to organisations when it enables people to draw on the knowledge of those around them so that they can improve their own work. By contrast, facilitating the flow of information and analysis from outside the organisation can only prevent failure. Because all similar organisations have access to the same external material, and the same imperative to make use of it, being good at understanding this material cannot be a differentiating factor (apart from improving speed to market). This means that if legal KM continues to focus on legal knowledge alone, it will become increasingly irrelevant to firms that want to improve their market position. The real differentiators are in the other points of the triangle. In order to get the best value from its knowledge activities, a firm needs to know with confidence exactly where its sweet spot is. This is not an easy task, and it is important in doing so to avoid entrained patterns of thought and behaviour. I intend to write more about this in a later blog post. And there are probably many more possibilities — these are just off the top of my head. I am developing these ideas for use with clients. If your firm is interested, please get in touch. I will also be talking about these issues at the London Law Expo next month — come and say hello. I am glad my ternary diagram is of interest – I think its potentially highly useful. I just need to point out that it the position of the Legal datapoint is not my “assessment of where law firms might sit in the model” – the position of the law-firm point is the average of the survey responses from the law firms themselves. I didn’t put law firms at the top of the diagram because I think they are product focused – they said, on their survey responses, that on average their primary focus is on product. I happen to think this is absolutely correct. The mainstay of legal KM is knowledge of the law. if you do not have this, then everything else fails. This knowledge is embedded in your products, namely the advice you offer clients. Sure you need to know your clients, but FIRST you need to know the law. Your product is a specialist product and requires specialist knowledge. It’s not like you are selling tins of beans or bars of soap to consumers, where what differentiates you is not the quality of the beans/soap but your knowledge of consumer behaviour and how to influence it. Customer knowledge comes to the fore in sales and marketing teams, and to date the legal firms are light in terms of sales and marketing (and rightly so). I agree that legal firms also need knowledge of process and knowledge of customer, and indeed the legal datapoint includes these aspects (60% product, 20% process, 20% customer). Legal firms may differentiate themselves by deviating from this proportion (say to 50:30:20, or 50:20:30), but I find it hard to imagine a case where knowledge of the law ever becomes less important than knowledge of process or client. Sure you can differentiate, but at heart you are a product-focused industry. However my observation would also be that legal firms don’t spread their KM efforts 60:20:20. Like you I believe they spread their efforts 100:0:0. The real value of this ternary plot is in allowing industries to learn from each others’ approaches. For example, KM practices in Oil and Gas are very similar to KM as practised in the military, as both are firmly at the Process end of the spectrum. So maybe legal KM needs to look at KM in the education sector and the manufacturing sector for analogues. There are probably some really useful things to learn, and to get away from the 100% product focus. I hope this is helpful, and is all meant to be constructive. Thank you for these great comments Nick. The correction is especially warranted. I was aware of the survey, but I underestimated the extent to which the positions on your diagram were self-certified, as it were. I agree with your other points — particularly the suggestion of learning from other organisations. My real concern is that firms aren’t doing that, but they may be benchmarking costs with other sectors when in fact the pressure of keeping up with legal knowledge (in addition to process and/or client knowledge) should lead them to spend considerably more — or at least more intelligently.